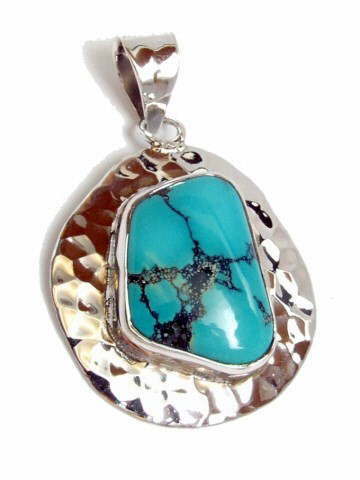 Large, top quality, Turquoise cabochon set in a stylish, contemporary, hammered design made of 925 sterling silver. This is an exquisite example of top quality Turquoise with a beautiful traditional colour. The markings on this pendant lead to this type often being referred to as 'spider's web' Turquoise because of the surface pattern. The various varieties of Turquoise around the world each differ slightly in colour and some have slightly differing metaphysical properties. These include: Tibetan Turquoise (contains the OM vibration, light greenish/blue in colour. Often Chinese Turquoise is passed off as Tibetan, so always try to buy from a trusted source), African Turquoise (quite green), Chinese Turquoise (also quite green/blue), American Turquoise (blue turquoise) Sleeping Beauty Turquoise (one of the best – pure deep turquoise in colour with little matrix).